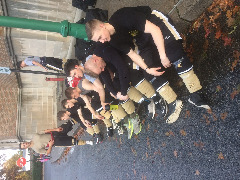 , WEST POINT, NY and WYOMISSING, PA - A weekend of home and away match-ups started inauspiciously...with a rainy home rink dressing room outside West Point's Holleder Center. But when the homestanding cadets entered Tate Rink for their first on-post game this season, shaking off the rain was the last thing on their minds. Facing the Rowan Profs - the only team to defeat the West Point club this season - the team simply wanted to avenge the loss, gain two key points in the MACH, and continue its strong play. Firstie Cory Miller led the way in the 3-2 win over the Profs, scoring the game's only first period goal and assisting on the only second period goal, staking ARMY WEST POINT to a 2-0 lead going into the third. Rowan cut the lead to 2-1 with an early third period goal just seconds after a Black Knights penalty expired. The teams locked horns in a tight checking, back and forth battle until Firstie Drew Lysakowski put the West Point squad ahead 3-1 on an unassisted tally. A late goal by Rowan kept the outcome in suspense but the cadets finished off the victory with strong defense and goaltending. Orion Boylston grabbed the win in net, stopping 29 Rowan shots. A quick roadie to the Black Knights' "home-away-from-home" BodyZone Rink pitted the squad against ACHA Division I regional rival Penn State Berks. Tight games against the Ice Lions the past three seasons seemed to foreshadow a competitive match-up, but the West Point team jumped all over the Berks boys, scoring the game's first six goals - three each in the first and second periods. Penn State Berks struck for two early goals in the third period, but ARMY WEST POINT capped the 7-2 victory with a final goal. Thirteen cadets were point scorers including Cory Miller (1G, 2A), Drew Lysakowski (3A), Max Krieg (2G), Keegan Thomas (1G, 1A), Jay Peterson (2A), Jake Stachurski (1G), James Fako (1G), , Alex Voronovich (1G), Zach Cohen (1A), Mitch DeRidder (1A), Brendan Ward (1A), James Hess (1A). and John Cahill (1A). ARMY WEST POINT peppered PSU Berks with 46 shots on goal. Boylston won again, stopping 25 shots in net.